Although asphalt continues to be the most widely used material in the roofing industry, metal roofing is quickly gaining popularity for certain projects. Materials like stone coated steel or Galvalume coated steel are used most often in metal roofing projects. A metal roof is going to last a long time. Generally, about as long as the house itself. Metal roofing doesn’t have the same problems with insects and rot as other roofing materials do, and is resistant to both mold and fire. It keeps water out and easily sheds snow as it begins to melt, and can survive high winds. If you want a roof that lasts, metal roofing may be your best choice. Metal roofing is surprisingly lightweight compared to traditional roofing materials. For example, tile roofing can weigh as much as 750 pounds per 100 foot square. Concrete tile can weigh as much as 900 pounds in the same area. However, metal roofing weighs between 50-150 pounds per 100 foot square depending on the type of metal used. 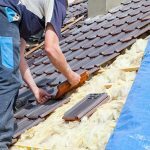 Lightweight roofing can help save money when building a new home or adding on to your existing home, because you won’t need as many support structures since there’s not as much weight to bear. Metal roofing does an excellent job of reflecting the sun’s rays and keeping heat from building up in your home during the warmer months of the year. It can also help hold heat in during the cooler months. Metal roofs are not for everyone. They are more expensive than other types of roofing and if not installed correctly, can be prone to leaks. However, professional installation and high quality materials can circumvent many of the cons people typically associate with metal roofs. Contact JKS Construction & Engineering, Inc. Today for a Quote! Interested in metal roofing? Reach out to us today to get a quote by calling 239-283-6054.